So The Post Sunday Special was launched. 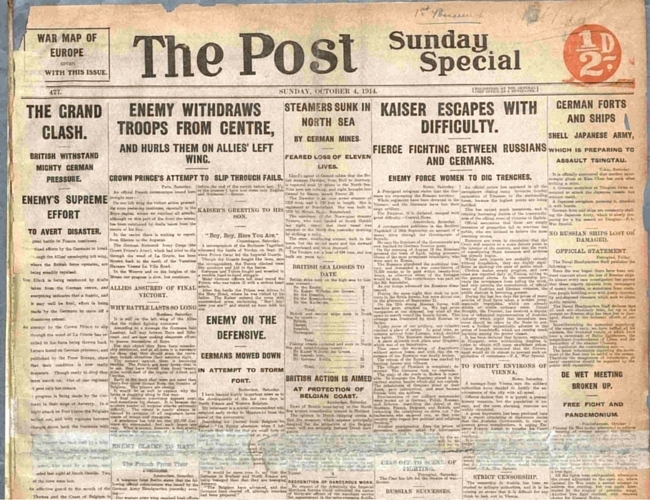 Crammed in to its eight pages were war despatches and political reports, alongside quirky human interest stories the Post would become renowned for. There was no sports coverage on the back page. Instead there was a pictorial showing images of war, with a headline stating “This Speaks For Itself” and a picture of Highlanders on the march. There was also a photo of Admiral Tirpitz, renamed “King Rat”. The new title became a hit and by the end of the decade was a bulkier 18 pages. On January 19, 1919, it ceased to be a special edition of The Saturday Post and was renamed The Sunday Post. It quickly became a firm and necessary part of Scottish life and regular features such as Francis Gay, The HON Man and The Doc became household names. By the 1970s it was the biggest-selling paper in Scotland with sales of more than a million, earning the Post a place in the Guinness Book of Records as the newspaper with the highest per-capita readership in the world. Today, more than a century after it was launched, the Sunday Post is still going strong.